For many, the capital city of England is the perfect location for their next adventure. Choosing Bakers Dolphin’s special ‘Coach Hire to London services,’ can help ensure your next London trip to London is stress-free, memorable and tailored to suit you and your group. No matter where you start your trip from - Bristol, Weston, Somerset or Gloucestershire - we can take care of your next coach hire to London trip from the moment you start. At Bakers Dolphin we offer a host of things to see and do in the capital city.They range from a sightseeing tour of the major attractions, visits to museums or art galleries; visits to theatres and concerts or even to major sporting attractions such as Wimbledon or a match at Arsenal’s Emirate’s Ground. Always popular, particularly with the ladies, are shopping trips; whether that be a visit to Britain’s biggest and most popular shopping destination – Oxford Street – or to one of the two Westfield Shopping Centre’s. And of course, for the young there’s always the famous market in Camden or at the other end of the scale the famous antique market in Portabella Road. And don’t forget that you can always combine a shopping trip with the opportunity to enjoy a ‘posh’ afternoon tea – perhaps in the famous Ritz Hotel or Claridges. Whatever you fancy, Bakers Dolphin can help you arrange it!For the historians, whether young or old, a London day out by coach means that besides a visit to the more well-known museums such as the V & A or the British Museum, we can help you arrange entry to other fascinating places such as the Imperial War Museum, the National Maritime Museum and Cutty Sark at Greenwich, or the Museum of London or the Docklands Museum – all of which can give you a further fascinating insight as the history of this wonderful city. Indeed, Bakers Dolphin can arrange access to more than fifty of London’s best-loved museums – both the more well-known and the less so. Whatever your reason for wanting to book a day out in London, putting the arrangements in the hands of Bakers Dolphin means you can relax in the knowledge that with over 100 years’ experience of looking after West Country travellers we know how to do it efficiently and cheaply. 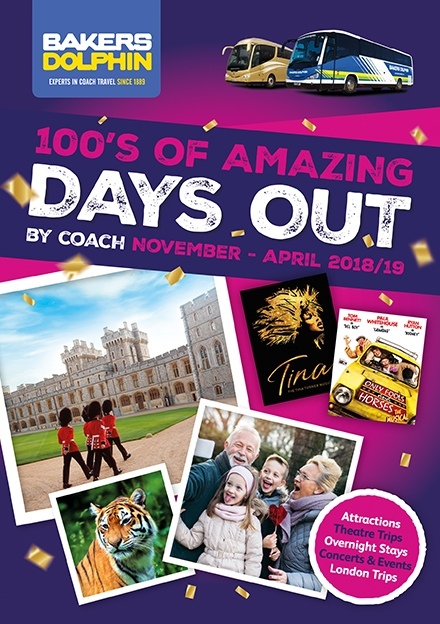 Our Events department can arrange and book tickets to hundreds of different attractions across the capital – whether it be a theatre or concert, an afternoon tea in a five-star hotel, or lunch or dinner cruise down the River Thames. Finally, as most of us will already know, travelling into and through London these days can be a challenge for many drivers. But that’s not the case for the highly experienced Bakers Dolphin drivers, many of whom have been with the company for many years. Together with our efficient route planning operational team, they will know the shortcuts to whenever possible avoid the worst of the traffic, pick the places where you can be safely and conveniently dropped off and picked up as close as possible to your destination; and how to get you and your party safely home again. So, as thousands of visitors to London before you will testify, booking a day out by coach to London with Bakers Dolphin will enable you to experience the best possible personalisedservice and ensure you will be in the safest hands throughout your trip. We offer a fantastic selection of well loved shows on offer in London's West End, Bristol and Cardiff. All trips include return coach travel.